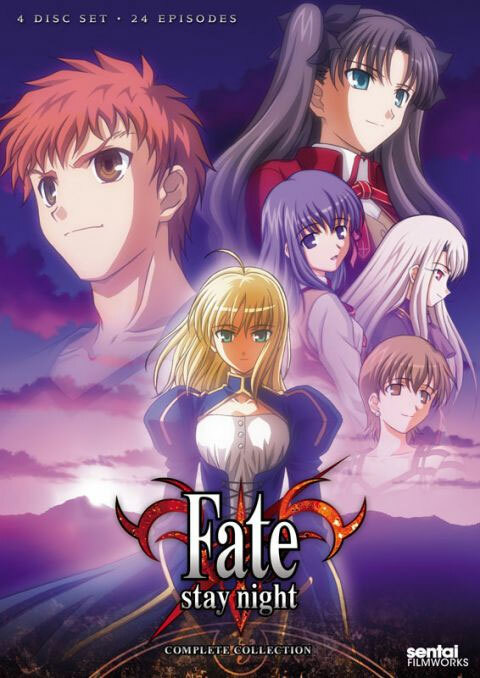 Fate Stay Night is one of those anime that you will likely hear about during your anime adventures. Even if you have no idea what the plot is, it’s just hard not to hear about this title. I’m always up for an action anime and this one involves a tournament so that’s always a good sign. The DVD cover could have been a little more interesting, but we can’t always have an action cover I suppose. The plot involves Shirou Emiya as he is still haunted by an event 10 years earlier, which burned away a large part of the area nearby. He lived through it and now he likes to help people out whenever he can. He thinks of himself as a hero of justice and he leads a rather ordinary life. He does have some magical abilities as he can reinforce an object to fix it or make it stronger, but that’s about it so he’s not much of a fighter. His life changes when he is selected to participate in the Grail Wars. He ends up summoning a servant by the name of Saber and together they must win or be crushed by their adversaries. The Grail Wars consist of 7 teams. Each team gets one master and one servant. The master is the human who is selected and the servant is a legendary hero who has been brought into the present to help out. The winning team can have their greatest wish granted by the Grail once all of the other teams have been terminated. Naturally, Shirou wants to win the Grail Wars without destroying anyone. He doesn’t really have a need for the Grail, but he has to win so that a villain does not. A noble goal, but will Saber agree? There are quite a few references to the previous Grail War throughout the show and it’s basically a subplot since it heavily involves Shirou’s past as well as Saber’s. As expected, the average humans don’t really know about the Grail Wars and are likely convinced that random fires just occur. The police don’t really appear at all and I suppose that they would ultimately be powerless, but you would think that they would make some kind of move after a big event happens at the school. Well, Shirou is the hero anyway to it’s up to him to save the day. Shirou is the main hero of this story and he’s a decently good main character. He makes his share of mistakes, but his intentions are usually sound. He does want to be a hero so he typically tries to save as many people as possible. He’s at odds with Saber most of the time because of how their battle strategies differ. He would rather fight the enemies on his own so that Saber doesn’t have to get hurt. That’s usually not a viable option so things don’t always turn out well for him. He can be pretty selfish at times since he wants Saber to stay on Earth instead of fulfilling her wish. He ultimately makes the hero move and he doesn’t attempt to force her with a command seal so that’s good. He’s hardly what you’d consider to be a perfect main character, but he gets the job done and he’s pretty determined. He also learns how to fight, which is a major plus. One thing about Shirou is that he’s not very smart. Usually, the main hero might be unsmart during normal situations and then become a fighting genius like Naruto, Luffy, and Goku. Shirou is like that to an extent, but one can argue that it’s more on Luffy’s level. He knows that he should never go outside without his servant because everyone wants to destroy him, but he loves taking a stroll around town and staying out until after dark. Nobody can attack him if their are witnesses (in theory) so he takes the time to go to school. The problem is that he waits until everyone else leaves because he was walking around in a daze. This leads into trouble of course. Next, Shirou goes to the park during the afternoon, but it’s in a secluded part of the city and nobody’s around….not his best move. Shirou makes these kinds of mistakes often and it can be a little tough to watch since you have to wonder why he would make these mistakes. Once or twice is acceptable, but it constantly happens to him and he definitely doesn’t seem to take the tournament seriously until the second half of the show. Saber is another one of the main characters and she gets a lot of hype. She’s known as the strongest servant and most of the enemies are supposed to fear her. I have to say that this is one of the problems with her portrayal. She acts as if she’s a very tough fighter and the others acknowledge her to be very powerful. Despite this, she spends a good portion of the series getting knocked out or fainting from fatigue. Her worst battle was when she was losing to a human. He was amped up with magic, but it should be physically impossible for him to defeat Saber. Now, the main reason that the show gives us for how underpowered she is…is because Shirou isn’t a great master. He doesn’t know how to give Saber any of his mana (energy) and he constantly takes hers away when he gets destroyed and his essence steals her energy to heal himself. That’s fine…..but it’s not great if you’re a Saber fan. Because of this, she’s constantly losing and we can’t even blame Shirou for wanting to keep her out of the fight. He does have a point that she is almost always injured and she can’t even use her ultimate attack without running the risk of dying from the energy drain. Aside from this, Saber is still a good character. She’s more no nonsense than Shirou and she doesn’t mind slaying her opponents as long as it is done honorably. She wants to win the Grail to fulfill an obligation, which Shirou disapproves of. I also think that the goal isn’t that great. Saber’s invisible sword makes for a good weapon and it reminds me of Creed’s blade. Saber prefers to stay detatched from the situation so that she doesn’t get emotionally invested, but that’s pretty hard to do when you’re responsible for keeping your partner alive through a long tournament. She gets a lot of character development as the series goes on. Luckily, she stays as a good character throughout the show. Rin is another one of the contestants in the Grail Wars and she’s allied with Archer. Unlike Shirou, Rin has always been aware of the Grail Wars and she’s been preparing for this for a long time. Evidently, she was not preparing for long enough because she ends up getting Archer instead of Saber. She’s disappointed, but she’ll devise a way to make Archer a threat. She uses more strategic means to attack her enemies and she’s willing to destroy anyone in her way. Rin is also a solid character and without her, Shirou would have been doomed from the start. She can actually fight on her own to an extent since she can fire energy blasts and use her gems to cause powerful explosions. She does make some controversial moves like trying to destroy Shirou to put an end to his misery, but she mostly makes the heroic calls when necessary. Most of what she did at the time was to help Shirou get more ruthless and to take the tournament more seriously, but he wouldn’t have any of that. Shinji used to be Shirou’s friend although we never really find out how this could have happened. From the beginning, Shinji is portrayed as a bully who is very insecure. He gets rejected two times by the same person, once for more than friends and once to be teammates. He was already corrupted, but this helps him accelerate into madness as he decides to destroy everyone at his school so that he can power up his servant and win the Grail Wars. He has Rider at his side and she’s the weakest servant in the tournament so it’s a little rough for him. That being said, it’s no excuse to turn into the villain and he’s forced to go up against Shirou. Shinji doesn’t have any redeemable qualities even though Shirou acts as if he’s merely made a few mistakes. Shinji started out as an unlikable character and that’s how he ended as well. Sakura doesn’t get a huge role in the anime and she mostly represents Shirou’s normal life. She helps him out around the house and it seems like they’ve been friends for a while. She’s a nice person, but she’s also a bit of a liability for Shirou since she’ll always be in danger as long as she hangs around him. Naturally, the villains know this as well and Shirou has to go to rescue her. It’s not really her fault that she can’t fight so it’s not a negative of course and she does stand up to Rin when the latter tries to stop her from going to Shirou’s home. (It was for her own good and all….) Sakura’s role is fairly small, but she’s a good supporting character. She doesn’t have any annoying traits like the friends in the average Marvel show….meaning the current Marvel shows of course. 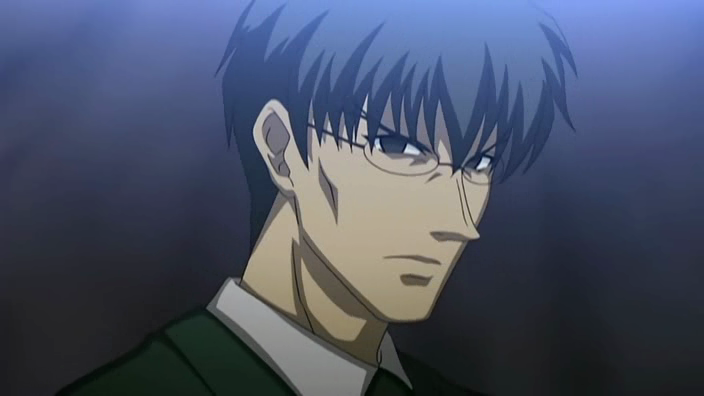 Kirei is the guy who’s in charge of the current Grail War. He’s there to make sure that everyone follows the rules and he seems like a decent person deep down…right? Well, it’s hard not to go any further without obvious spoilers, but he’s definitely not a great character. He believes that the end justifies the means and he basically loses it. He’s certainly not a likable character by the end and he definitely did seem shady from the start. He can put up a decent fight when necessary, but he typically relies on the element of surprise or abilities that happen to be around for him to use. Taiga is another one of Shirou’s friends and she doesn’t really add much to the show. She’s mainly there to keep the show light and to bring in some comedy once in a while so that the show won’t be too dark. If that’s the reason for her character…then it doesn’t really do a great job. It adds some light scenes, but they aren’t very interesting and Taiga isn’t the greatest character out there. She only has one emotional moment where she tries to get Shinji to sound the alarms….but this is Shinji that we’re talking about. Taiga means well, but she’s a little overdone for comic relief. Also, eating a lot is supposed to be the main character’s job…but his friend’s! Issei is Shiro’s most minor ally. He only appears when Shiro needs some practical data or to stop Shiro from making the wrong calls. Issei does a decent job on the latter part, but he’s not very subtle about it. He’s a moral person who tries his best to stay to the straight path of being nice, but it’s tough since a villain infiltrates his main group’s building. He’s naturally oblivious to this and he never gets to do anything that is relevant to the plot. I would say that he is my favorite character from Shirou’s friends though. We needed a guy like him to keep Shirou alert. Illyasviel is another one of the masters and she’s pretty good as well. Her character change is one of the more drastic ones and yet…her personality isn’t really affected. She’s one of the more dangerous opponents because she definitely has no qualms about destroying all of the other combatants. She also doesn’t mind using a sneak attack to put her in a better position to win the Grail. That being said, I was still pretty shocked when she used the paralysis spell in the park. It really came out of nowhere and I had thought that there would be a truce since she had been acting like a friend. Ah well…that’s why you shouldn’t underestimate her! From the humans, I dare say that she’s the best master in the show with Shirou and Rin not being far behind. Soichiro is the final master and he’s pretty good as well. He’s portrayed as one of those guys who will do anything if it will please his partner. His servant is Caster, but only in technical terms since they fight as if it were the opposite. He doesn’t seem like he was actually a bad guy, but he still is. Essentially, he’ll do whatever Caster tells him to do even if it means sacrificing an innocent person or destroying a student. He’s far more likable than most of the other enemies, but he’s still not someone that you can really root for in the end. I just loved his fight scenes, which helps him rise up in my books. He ended up being a little too overpowered so some help from the plot was in order for his ultimate end. Lancer really gets the shaft in the show. He appears at the beginning of the series and he’s hinted to be one of the strongest fighters. He gets a hit on Saber and his Noble Phantasm seems to be very lethal. Unfortunately, he manages to vanish until the final pair of episodes where he pops up out of nowhere. Unfortunately, we don’t even get to see him fight as his action scene is off screen. Well…..so much for that. I still do like him and he was one of the best servants in the show. He was an antagonist, but he still had honor and he believes in fighting the right way. It’s too bad that he couldn’t appear more, but his opening fight scene was still fun to watch and I suppose that I’ll just have to make do with it. I have to say that the writers must have forgotten about him during the show. Archer is easily one of the best characters in the show. His banter with Shirou is always fun to watch and he’s pretty rebellious. He disobeys Rin’s command to help Shirou and he never wants to help out. He only does so to protect Rin and the whole tournament seems beneath him. There was one really out of character scene where Saber defeats him in a single blow, but I think that was really to help the Saber hype. The problem is that he’s out of commission for quite a few episodes and then he just gets one more fight in the series. Ah well, he’s still an epic character to root for and I believe that the voice really helped. It definitely matched his character and the voice actor delivered the lines well. Archer’s Noble Phantasm attack is pretty good since he has a lot of weapons and he can keep on replenishing them. He easily had one of the best fights in the show. Assassin is the main reason why Archer isn’t my favorite servant. He’s easily the best character in the series and it’s regrettable that he didn’t get a whole lot of screentime. He’s just interested in having a good fight and he gets to pit his skills against Saber’s twice. Those two fights are his only battles in the show, but they’re pretty good and show how powerful he is. He doesn’t have any big attacks and his Noble Phantasm is actually pretty straight forward compared to the others. He really relies on pure swordsmanship and that just shows how skilled he is. Many of the others others would not have been able to manage without some kind of edge. Assassin’s plot twist at the end is pretty sad so you also feel bad for the guy. At least he got to have a little fun before the end. 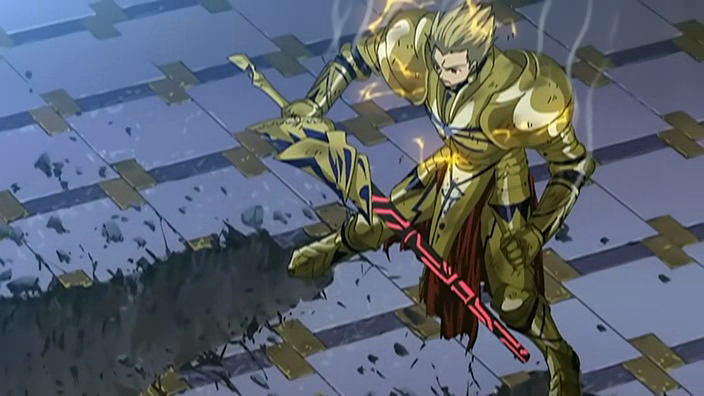 Gilgamesh appears during the final phase of the anime so he appears very suddenly. He easily has the best entrance in the series. No other character got to appear in such an epic fashion and he instantly proved why he was a cut above the rest. I was actually a decently big fan of him for a while, but his goals start to get more and more iffy as the show goes on. By the end, he’s basically not likable anymore, but he is definitely a powerful villain. He knows how to put up a good fight and his design instantly reminds me of Saint Seiya. This guy definitely has the appearance of a Gold Saint and he has the power to back it up as well. He is one of those characters who is still a little too powerful, but luckily the show manages to find a (semi) believable way of handling him. It was still a little dicey, but definitely more believable than some of the other fights. Rider seems to be the weakest servant and I can definitely see why. She is not impressive in the slightest and I would definitely say that she’s my least favorite servant. She uses a chain to attack and once she stabs you with it, then it’s hard to break free. She’s very quick, but that basically rounds out her array of abilities so she’s hardly a threat to the other fighters. She actually has multiple battles with Shirou, which is something that could not happen with most of the others. 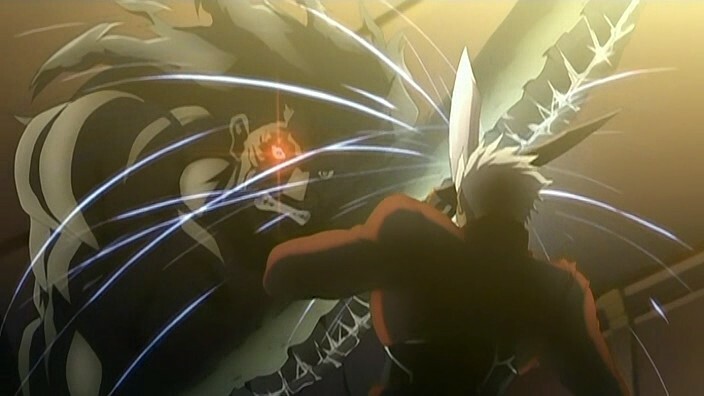 Shirou and Lancer’s battle had an abrupt end and likewise with Shirou’s one second battle against Gilgamesh. Real servants should be able to take down a human in an instant and that didn’t happen with Rider. I definitely couldn’t wait until she was defeated so that we could move on to a more interesting fighter. To her defense, Rider does have an ultimate attack, but it’s more like she’s just using someone who actually has power so it’s barely worth mentioning. Caster uses magic to fight her battles since she’s not much of a physical fighter. This is pretty unique for a servant so she makes sure to have others do her bidding. She amps up their abilities so I wonder why she cannot do the same thing to herself. Either way, she’s still more than a match for Rider, which is also a little embarrassing for the latter. She had an interesting backstory and one would almost think that she was not completely evil until you remember her present actions. She was much better than Rider, but not nearly as cool as some of the other servants. There just doesn’t seem to be any way to sympathize with her and I have a feeling that getting the grail using a cheap trick like the one that she attempted would backfire in some way. I have to say that Fate Stay Night is a great anime to watch at night. There’s always some tension in the show and most of the episodes conveniently take place during the night time. Even if it’s day time, it’s always cloudy so the sun never really comes out. You can never let your guard down because everyone is out to destroy Shirou. The series just has a scary vibe to it and it can feel like a horror show at times. Only in the atmosphere luckily as horror doesn’t have the greatest track record in any form of media. It’s definitely a change of pace from the average anime and the darkness isn’t too overblown. 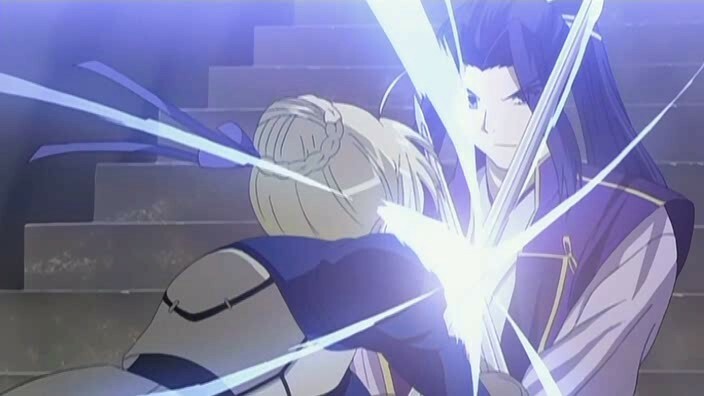 Now, one part of the show that I really didn’t like was when Shirou had to give Saber some of his power. To do this, it involved a CGI dragon which was all right, but the real world things that were happening were pretty awful. It makes Rin and Shirou look terrible as well and I can safely say that it was a sad moment to be a fan of either of them. It’s just one scene and it’s luckily never really mentioned again, but it’s still hard to forget. It’s also hard to call Shirou a hero after that since he was told not to do it by Saber. Shirou just kind of ignored that. I mostly just block the scene out, which is why the sections for Shirou and Rin are still positive. It’s just one of those moments that comes out of nowhere and the writers must have just panicked. It was probably the only really big wince worthy scene in the show. That being said, the show does unfortunately have some fanservice. Not a whole lot of it luckily, but there are two major scenes with Saber that come to mind. The generic hotsprings/bath scene is in just about everything nowadays and these two are used to show how Saber’s personality has changed from the beginning to the end. There are many better ways that they could have done this. Compared to other shows like Index and Sword Art Online, it’s definitely not bad, but it could be better. If nothing else, Attack on Titan did get one thing right and that was the fact that it basically had no fanservice in the entire show. Despite the dark tone of the show, Fate Stay Night isn’t really that violent. The only big scene that you would want to be on the lookout for is when Rider first uses her final attack. Using it involves stabbing herself in the neck for whatever reason and we get a big Bleach spray. A few characters basically lose their arm or get critically injured, which looks a little more violent thanks to the really high budget for those scenes (Like Index) but it’s not that bad. If you’ve seen Bleach, then this should be okay and the Rider scene is the only one that you may watch out for. The Church’s underground is one scene that’s pretty disturbing since we see a lot of parts so many people didn’t quite make it. Luckily, they don’t go into detail so I like to think that they met their end quickly. Luckily, those are only a handful of scenes and they don’t really derail the show. Some parts may be unnecessary, but no show can be truly perfect. (Not even Yugioh GX) I would have liked some more city battles because anime in general seem to avoid them. There is only one of them in the show and that’s when Saber fights Rider on top of a sky scraper. I don’t care for Rider and her battles aren’t the most entertaining, but I did enjoy the setting for the battle and I’ll never get tired of city fights. The animation for the show was only all right at first. It actually looked a lot older than I had been expecting and the fights with Saber were very stiff. The way that they drew her attire made it look like more of a dress made out of steel than something made for combat. Because of this, she could barely move in the fights. Luckily, the animation got way better for the second half of the show. It’s hard to say when it got better, but definitely after the first fight with Berserker. I’d say that the Archer vs Berserker fight was when the animation began to shine and it didn’t really look back from there. All of the final fights are pretty great and the animation quickly rose to be top tier in quality. The fights are nice and varied throughout the show. Technically, most of them use swords or similar weapons to fight, but their personalities and Noble Phantasms are different enough to make them all exciting. At it’s best, the show definitely contains some of the best fights that you’ll see in anime and the speed is comparable to Bleach and Sword Art Online with how fast they’re swinging their swords. My favorite fight is actually Soichiro against the heroes (Round 1) since it was fun to see how a hand to hand fighter would fare against them. Let’s just say that I have my answer! Fate Stay Night doesn’t disappoint with the soundtrack either. Most of the themes used in the episodes are opera themed and they fit the dark atmosphere perfectly. The battles all have an epic feeling to them and even the to be continued music is pretty catchy as well as the preview music. I didn’t care for the first theme song at all and it likely helped the first half to not be quite as exciting as the latter episodes. Luckily, the second theme song is pretty great and I would say that it’s easily one of the best anime openings. The music is definitely 5 star material and there aren’t many anime that can match it in the end. Overall, Fate Stay Night is a pretty solid anime and it can hold up against the current mainstream titles like Sword Art Online and Attack on Titan. (Slaying Titan and Completing its victory against SAO) The cast of characters is pretty large and while some of them may be bland or unlikable, there are quite a few of good characters in the mix. The soundtrack and animation are pretty good and help to make the show that much more enjoyable. I highly recommend this show to action fans. The plot is also pretty deep and the dialogue is interesting so you should also enjoy it for the story if you don’t care for action. My only regret is that Archer didn’t get to fight Gilgamesh. This entry was posted in 7 Star TV Shows, Reviews, TV Show Reviews, TV Shows and tagged Action, Anime, Anime Review, Archer, Fate Stay Night, Grail Wars, Review, Rin, Saber, Shirou Emiya by dreager1. Bookmark the permalink. It was definitely really good and I’d choose it as my favorite Fate entry!